In the front left corner of the room, a banner proclaimed this four-way test. As I read it over, I realized we subconsciously apply this test to all of our deals. Now we can apply it consciously. My friend and insurance agent Carolyn Henderson has been trying for some time to drag me to the local Rotary Club meeting. Like almost everyone, I grew up hearing the phrase “Rotary Club,” and I knew they had something to do with business. So I recognized the invitation as a good networking opportunity, but I put it off for two long. Sometimes I still have trouble recognizing myself as a business leader instead of just another cog in the wheel. Well, I finally broke down and went one of the weekly meetings. Boy was I surprised. The island is a pile of debris at the moment, but that’s a gas line poking up! We’ll be cooking with gas! It’s time for the weekly Bobcat Lair update. It looks like the contracting team must have another project, because not a great deal was accomplished, but there are a few highlights. We mainly went over there to finally drop off the bedside wall lamps for the master bedroom and a piece of furniture that can hang out there rather than in the tiny casita. We found the beautiful bathtub was installed in the master bath, but for some reason the photo didn’t come out. Well, it’s the one in the illustration for this useful article on bathroom trends. I did get a picture of the new gas line that’s poking up into what will be the island that holds the gas cooktop. That means they were working on the gas line, and maybe fixed the one that broke. Good news there! Another BIG thing is that on the outside of the house, where the windows are not present anymore, there ARE two beautiful new HVAC units. Looking forward to functioning air conditioning, that’s for sure. 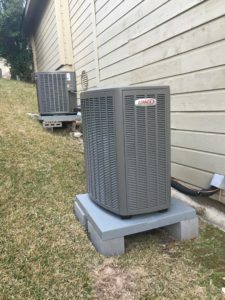 These are very efficient, high quality systems that should last for many years. That’s appropriate for this more upscale neighborhood. There are two good things here. You really can’t see where the office windows used to be AND those are brand-new HVAC units on nice sturdy bases. Yay. 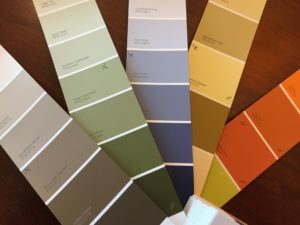 Last weekend I realized I had pretty much lost all the color choices I’d made two years ago, so we went through the color wheel and chose the accent colors for various rooms. Since “it’s just paint,” I went a little bold. The master bathroom will be a periwinkle/violet color, which will look good with either gray or dark purple towels. The master bedroom will be a yellow that goes nicely with the periwinkle, with a chocolate accent wall. That matches the curtains and bedding I already have. The yellow is a soft one, not a glaring one. All the bedrooms need bright colors, since there are only windows on one wall. The kitchen will be a sage green, but it will be tempered by cream colored wainscoting in the breakfast nook. There’s also not that much to paint in the kitchen. There’s lots of gray marble backsplash. The blinds we get made will probably be cream, too, as will most other walls. A gray that matches the cabinets will cover one living room wall (next to the fireplace, so there’s a contrast between the limestone and the wall) and one staircase wall. The rest of the main area is the same cream color as most walls downstairs. A perky persimmon orange will brighten the laundry (one wall) and powder room (all walls). Paint colors! The ones with an x are the ones referred t in the post. The downstairs rooms will have a lot of cream, since there aren’t many windows. The wine room will be the brown of the master bedroom. Cozy. We’ll paint the wine racks cream. The office will have one colored wall, we are thinking the same green as in the green bedroom (craft room). The new “bedroom” we haven’t decided on the accent for. It could be the same orange as the orange bedroom. We will just have to wait on those rooms until we are inspired. We may even just paint them the main color and decide later. If we decide the colors are too bright for resale, we can slap a couple coats of the gray over all the accent colors, and voila, the whole house will be what buyers want. Gray and white. Winter blues got you down? When you lack self-confidence for any reason, progress becomes really difficult. I find it helps to break tasks into small, manageable chunks. I promised you, gentle reader, that this blog would take your through all the ups and downs of our journey. This post is about one of the downs, no pun intended. Seasonal affective disorder (also called SAD) is a type of depression that follows the seasons. The most common type of SAD is called winter depression. It usually begins in late fall or early winter and normal mood returns in summer. A less common type of SAD, known as summer depression, usually begins in the late spring or early summer. SAD may be related to changes in the amount of daylight you get. I have never been diagnosed with SAD, nor do I exhibit all the symptoms. But I deal regularly with depression-like symptoms around the winter holidays, which is only a little ironic since winter is my favorite season. I tend to suffer from an increasing reluctance to interact with people, or even to leave the house, at this time. My self-confidence—my faith in myself, as it were—suffers. I envision the most negative results from every decision or social interaction, and acting on things becomes very difficult. And business requires action. I don’t know that I’ve ever talked to anyone seriously about this topic; it’s just something I deal with. As a natural introvert, making public appearances, much less public speaking, is difficult at best. This time of year, it is more difficult, but it starts with getting dressed and starting the car. If I can do that, I can get through the rest of the day. Every day in this business is a challenge. No two days are alike. There are a lot of unpleasant tasks that have to be performed. So all anyone can do is take it one day at a time. I make myself do the work. Chunk it into manageable pieces so I don’t get overwhelmed. Get dressed to go out. Go somewhere to network, work on deals, or strategize with other people. And take it one day at a time until I work through my crisis of faith in myself. As my friend, Kimberlee says, “Do something for your business today…out of the office.” It helps. But if you suffer from real clinical depression or full-blown SAD, self-motivation may not be an option; in that case, seek professional help. 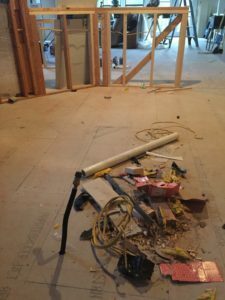 We hear the phrase “working as designed” a lot when dealing with the things our contractors do. Hey, why are all the light switches backwards? Oh, that’s working as designed. Um, why is there no water pressure? That’s low-flow faucets–working as designed? Well, you know what we mean. Today I’m sharing an example of something working as designed. 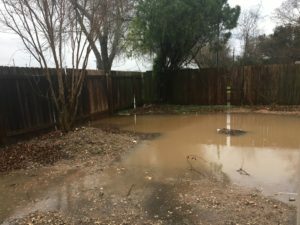 You may recall that we had quite a few issues last year with the water and sewage lines going from the B unit at Villa Park (the casita). It had to be done, because previously water flowed IN to the little house. Nice. 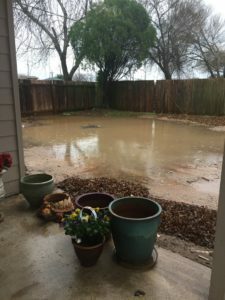 Our team had to put in a pump to get water to the street, because of the way the land sloped, they had to do a whole lot of contouring around the house, and well, spent months fixing pipes. The city inspector kept insisting on more and more improvements before passing the house as fit to occupy, so we did them all. It didn’t help t hat week before last, someone drove over the sensitive pipe area next to the house and it had to be replaced. Sigh. Beside the point, but more money on drainage. Or drains. Or pipes. You know what I mean. Water, eater, everywhere EXCEPT in the house. We win. It’s really good to see that all those changes the inspector insisted on having us make were the right things to do. The house remained high and dry, while water flowed in an orderly fashion AWAY from the house. Working as designed! Yes! No more raw cedar! The windows blend in. Things continue to roll along at the Bobcat Lair. Growl! 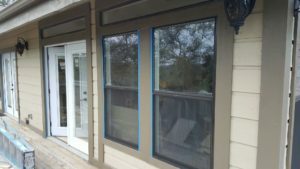 This week, despite the torrential rains, the team managed to paint the areas where new windows were installed, so that they blend in with the rest of the house. You can’t even tell they weren’t there all along anymore! The white doors you see in the pictures will be painted to match the front door, so all exterior doors will match. The darker color will blend in well. These doors and the deck will be painted at the end of the process. There is more decking to replace, especially the rails. 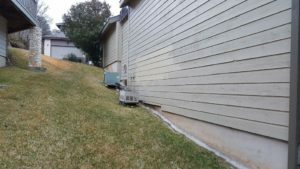 We would love to put in modern railings, but our friends at the Home Owner Association refuse to let us do anything the the 80s style that’s there, so at least we can make nice looking 80s rails! Now that the paint is dry, you can’t tell our ill-fated windows were ever there. And of course, the HOA also nixed the office windows. So, they are gone. We will re-use those nice windows on another property, so all is not lost. 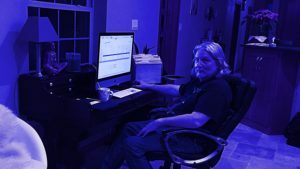 It will be fun installing bright lighting to make the office a cheerful place to work. One thing we CAN do is put in a door with windows in it, to bring in light from the inside of the house. We’ll see if that’s in the budget. 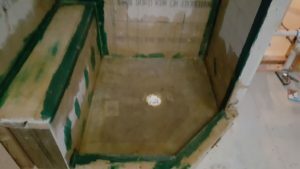 And just because we got a picture of it, here’s the shower, all fiberglassed up and ready to hold water. Moving right along! Master shower. All water-tight and ready for beautiful tiles.